In the first of a new monthly series, Christie’s International Director of Wine, Tim Triptree opines on the delectable ways to extend your summer. The Mosel Valley, home of some of Germany's finest Riesling wines. Following distant memories of the British summer heatwave, thoughts should turn to what summer wines to drink when the weather gets cooler and the nights draw in. However, predicting the weather in the UK is notoriously difficult and should the good weather remain at the end of the summer, then I would suggest continuing the theme of drinking crisp whites and refreshing reds and would like to share some recommendations. Hopefully, my optimism for the weather will be rewarded! Riesling really does fit the bill as a refreshing white wine and typically has youthful floral and delicate perfumed aromas, such as peach and rose petals with lime and apple flavours, always with mouth-watering acidity. The wines can even have a mineral touch with nuances of gun flint and slate (especially those from the Mosel Valley in Germany) and can develop petrol and kerosene aromas with bottle age. Germany produces many great value “fine wines”, particularly from Riesling, planted in the Mosel, Rheingau, Pfalz and Nahe. German vintners have been blessed with a run of good vintages, particularly the 2009, 2011, 2015, 2016 and soon to be released 2017s, which was a low-yielding vintage due to spring frosts in April 2017 damaging vine buds, and especially badly hit was the Mosel (so stock up on these when you get the chance – some are now being released “en primeur”). The Mosel is a great place to visit, particularly in September when the harvest will be in full swing. 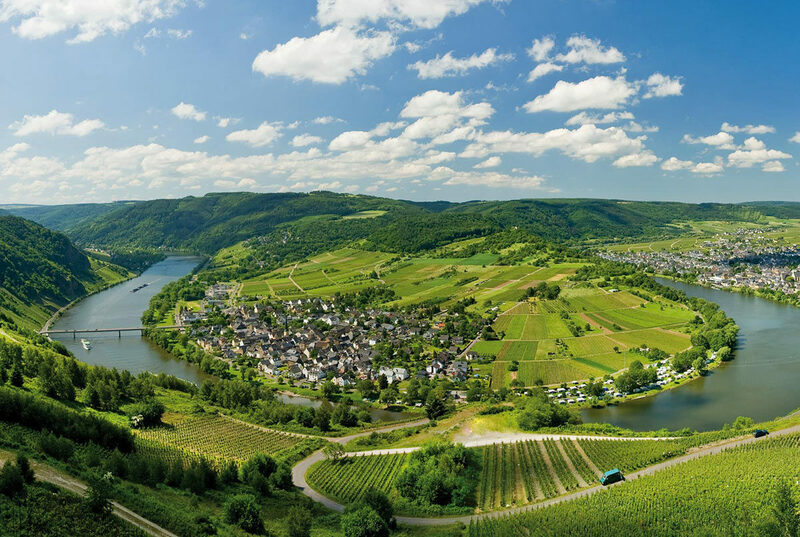 The scenery is stunning with extraordinarily steep vineyards planted along the banks of the river Mosel; supposedly some vineyard workers have fallen to their deaths, so be careful! German Riesling wine styles vary from sweet to dry, but are typically perfectly balanced by refreshing acidity so they are never cloying and over-sweet. However, this variability in sugar levels does make a little bit of knowledge invaluable to ensure you buy the wine style you like. If you like dry styles I would suggest looking out for those labelled “trocken” on the label (means ‘dry’ in German) and Grosses Gewächs which are some of the finest dry Riesling produced in the world from a select group of high-quality wineries that are members of a group called the VDP (Verband Deutscher Prädikatsweingüter). If you like sweeter styles, then in ascending order of sweetness choose, Kabinett, Spätlese, Auslese, and the unctuously sweet dessert wine styles of Beerenauslese (BA for short), Trockenbeerenauslese (or TBA) and Eiswein. Alsace and Austrian Riesling are other favourites of mine and typically are dry styles; look out for these producers from Alsace: Hugel, Rolly Gassman, Trimbach Weinbach, Zind-Humbrecht and from Austria; Schloss Gobelsburg, FX Pichler and Weingut Bründlmayer. In Australia Clare and Eden Valleys typically produce delicious and refreshing dry styles with lime and lemon flavours which develop hints of toast with bottle age. For the reds, Beaujolais has experienced a revival over recent years, producing delightful crisp reds from the Gamay grape, which can be served lightly chilled. If the weather gets cooler then this calls for more robust reds, and some of the top Estates in Beaujolais are producing age-worthy examples from the best areas, which are called the Cru of which there are ten, which are Brouilly, Chénas, Chiroubles, Côte de Brouilly, Fleurie, Juliénas, Moulin-à-Vent, Morgon, Regnié and St-Amour. Producers to look out for include, Thibault Liger-Belair, Julien Sunier, Marcel Lapierre, Jean-Paul Thévenet. Heading further south in France, Syrah from the Northern Rhône (called Shiraz in Australia) produces wines with spice and black pepper aromatics and a core of sweet black fruit flavours, a great match with more robust foods eaten in the autumn. The finest examples come from Hermitage and Côte Rôtie and are more expensive due in part from limited production from these small geographical areas. These are powerful red wines, with a deep colour and firm tannins that provide the potential to age and evolve in bottle developing meaty and smoky characters. More affordable Syrah wines can be found from St Joseph, Crozes-Hermitage and Cornas. If the weather really cools down in September, then you can’t go wrong with top Shiraz from Australia which is velvety smooth, rich & opulent with blackberry jam, fig and prune flavours and develops hints of leather and caramel sweetness with age. Look out for producers in the Barossa and Eden Valley, such as Henschke, Kaesler, Seppeltsfield, Torbreck and Two Hands.